We had to get a random cab who got lost. Janus came to rescue us which was the perfect intro to our trip. Janus goes above and beyond while your here and thats great. Day 1- we flew in and forgot to organize a ride. We had to get a random cab who got lost. Janus came to rescue us which was the perfect intro to our trip. Janus goes above and beyond while your here and thats great. Our first night we hang by the pool and then went to Hummingbird beach for dinner. It was great and easy to have the phone to organize a ride. Day 2- After sleeping in we called Janus for a ride to Anse Mamin. You get dropped at Anse Chastanet and then follow a path to Anse Mamin. The 5 minute walk is worth it for a more secluded place. We were one of three groups there so the majority of chairs and huts were empty. We each got burgers on the beach and it was the best lunch of the trip and potentially the best meal. The best part is not having to leave the beach for it. That night we went to bayside at Sugar Beach. Food was good but not outstanding, but definitely worth the view one night. Day 4 - We finally made the walk to town to buy groceries. We made both lunch a dinner at home and laid around the villa all day. It was Amazing. Day 5 -We hiked Gros piton. Ryan is fairly out of shape and we still did it in under 4 hours (full disclosure, we is an ex college athlete with no national championships, so what he lacks in fitness he may make up for determination and an ability to push through pain) Kayleigh thinks everyone should attempt this, the view from half way is amazing so even if you cant do thw whole thing you still get views that will last a lifetime. 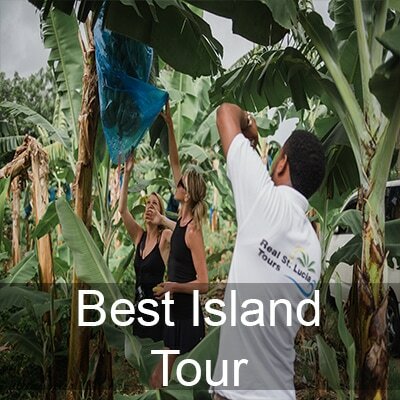 We went through St. Lucia Tours and this experience was awesome. Highly recommend. After a shower we went to Hummingbird for Lunch (yes this is the third time) Ryan got a burger and kayleigh got conch again. After the meal Ryan almost made a dinner reservation! Instead we laid by the pool and ate at home. Day 6 - We leave for Sandals today at 11. The check out of 11, allowed Kayleigh to read by the pool all morning and soak up some final rays. our flight was delayed but someone from Islander Cars was there to greet us the ins/outs of the car, island and directions. We are here for 9 days and the rental is US$600.00. if you haven’t driven on the left side of the road before (like us) it is very different but steve got the hang of it pretty quick. Tip – blinker are on the right. We stopped at Massy’s supermarket as recommended by Janus. It was busy! They do take usd & Card but takes a little longer to process cards. We were shocked at the prices at the store. We got break, milk, eggs, packable lunch and snack items water and beers and it was US$147.00. OMG!! We were greeted by Janus upon our arrival to the villa, - 1 hour drive. Walked down for Ruby’s pizza but they are no longer in business. Walked back up and Janus greeted us he lives right next door and offered to drive us to town to show us a place to eat. We ate at Pitit Peak- it was OK. Traditional St. Lucian Food/seasoning. 2 meals, 4 piton = US$70.00. Came home, sat on porch star gazing and went to bed. Tip- call and make reservation in advance (atleast 3 weeks). Our experience at Jade Mountain was second to None! We felt like celebrities and they all (staff) treated us so nicely. Our reservation was for 6 for a sunset sinner on a Sunday. We arrived at 5:45pm (HIGHLY RECOMMEND) We were the only ones there until about 6:00 which meant we had the entire place to ourselves. I am so serious when I say you have to do it. First we got a driver from the villa (best choice)- Ask Janus to Set up (us$10.00 each way) they drop you to the bottom and the shuttle take you to the top. Orian was our driver – so sweet and told us about his time at Jade Mountain. When we got to the top, he walked us in to the resort/ restaurant. When we checked in we ordered our drinks and while they were being prepared we were escorted to the top where you have a 360 degree view of the island; the Pitons, Anse Chastanet beach, sunset, rain forest. They even offered to take our picture. We enjoyed our drinks until dinner and went back downstairs and got to choose our own table. The service was second to none. I've never has this good of a service, the all worked together to ensure our night/experience was perfect. We each had 2 drinks, 3 course meal and shared a dessert. Our bill was U$215 – totally worth every penny. We told them it was our Honeymoon and they brought us another dessert tat said ‘’Congratulations’’ How sweet. We had even read in this book Janus’ cousin works at Jade so we introduced ourselves to him and he even greeted us at dinner and treated us with dessert wine & chocolate. We even got entertainment of Steel pan. We called our driver (jamal) and he was here quick. Tip- plan on being there about 3:30. ENJOY!! P.S – we ended up having lunch at Hummingbird just down the road from Orlandos. Ambience was great. We ate by the pool. Staff was friendly. Food was good and decently priced. We split a burger and had 2 pitons for US$25.00. Tip – if youre in a hurry go with the flow. If you are on a time constraint give yourself extra extra time. Back to Hummingbird for lunch! Superb! Then took a water taxi to Sugar Beach for a couples massage. US$50.00 round-trip for water taxi. The rainforest spa is amazing! Staff was super friendly, service was good (7/10) could’ve used a moister under knees and a bit more pressure (us$50.00 for deep tissue) Ambience and atmosphere was phenomenal. There was a lady smoking a cigarette right next to our hut which was a bit disturbing. Boat Taxi back and shower up for dinner with chief Ramsey! Great food Great Experience, great person. What a fun experience we’ll always remember forever. The mango daquaries he made us was sooo yummy. We really loved talking to him and having him cook for us was an honor. Woke, ate breakfast and made the trek to go visit pigeon island and beach at Sandals Grande. Pigeon Island is cook and hike to top is easy. Beautiful beach out of the best on Island. The resort staff Is very quick to checking if youre a guest and make sure you don’t use any of the hotel amenities. Its about 1.5- 2 hours drive from Villa to Gros Islet. We made a couple stops along the way for pictures and has a couple pitons in Rodney Bay at a cute café called ‘Café ole’ ( smoothies, coffee, pastries, beers, wraps, sandwiches, salads) slow service. Good prices good food. Showered back at home and made our way to Pounty’s Pizza (Hawaiian for recommendations). So good. We’ll be back!!! Off to bed now!! Had coffee on the Patio this morning before going to town for more cash at the ATM. Then went to a little place for breakfast on the bay- wont be back. Ordered a breakfast sandwich and the bacon was questionable. After walking a few doors down to Zakas- have heard quite a lot- theyre awesome. We got 2 smoothies at US$4.00 each. They sell coffee. We’ll probably go there again before we leave. We stopped at JC’s (liquor store_ for beer and water then changes and head ed back to Anse Mamin for a second time. If youre feeling adventurous simply walk further down the beach towards the rocks and take in the beauty and total peace. Tip- wear sandals /shoes, the sand gets hot. After a few hours at the beach we headed home, showered and has dinner at Orlandos. We didn’t have reservations but It wouldn’t hurt. Luckily we got right in. it was the first jazz night. Great entertainment & Atmosphere. Food was the best in Soufriere. Up early for the Gros Piton Hike. It took us 5 hours to complete. 1.5 hours to hike up and 1.5 to hike down. For level of difficulty it was probable 8/10. Challenging but able to take many stops. Nice view at the top but Tet Paul was better. It was agood challenge to see if we could do it. At the bottom There are Pitons and home-made ice-creams for sale (us$4.00 each) The mango ice-cream was so good. After we had lunch them back to pool and lounge and nap. Went to dinner at Pier 28…SCRATCH THAT- We tried to go there but aweful smell filled the place so we went to Pounty’s for the 3rd and last time. We walked in town a bit then got ice-cream from a small place opposite the gas station on the bay. Jade Mountain – fancy, once in a lifetime opportunity. Day two- Villa Day! We spent the entire day soaking up the sun poolside. Stocked up on Pitons (US equivalent of a Corona). Dee-lish & refreshing! Wear sunscreen! Day one- Loooong travel day! Arrived at 8pm & kindly greeted by Janus. Quick tour & off to bed! Day two- Villa Day! We spent the entire day soaking up the sun poolside. Stocked up on Pitons (US equivalent of a Corona). Dee-lish & refreshing! Wear sunscreen! Once the sun starts to set, open all the doors & windows to let the cool breeze in. Dinner was with Ramsey, the private chef- Mango grilled seafood did not disappoint!! Such a treat & a wonderfull gentleman (he even cleans up!). Worth every penny! Day three- Took a walk to th ediamond botanical gardens. 15 minutes or so. Easy walk, go early 10 am & bring water. Tried to check out Ruby's but its closed :( A new restaurant should open by the end of the month. Booked a snorkeling tour for this week through Simon Says- very reasonable. Headed off to Dasheene at Ladera. The view is beautiful. Get there by 5 to catch a gorgeous sunset. The food was ok.3/5? The chef right here at the villa was much better! TIP: Don't fall asleep before doing the dishes or the ants will visit LOL. Day four- Woke up early and caught a ride with Jannus and his son- Janus is truly a wonderful host. Grabbed a few groceries from Eroline. Headed over to Zaka's- get a smoothie for the walk home. Yum! Spent the rest of the day relaxing and napping! cooked dinner together and enjoyed a movie. Day five- Another great day spent poolside. Had dinner at Boucan- Hotel Chocolat. A-M-A-Z-I-N-G. DO IT! Day six- Woke up early to meet up with Simon Says- drove us to Hummingbird Beach Resort and took a water taxi to Sugar Beach and Anse Chastenet to snorkel. Both beautiful but Anse Chastenet had better beach. After snorkeling we returned to the resort for a buffet style lunch. It was okay. After waiting a while we realized Simon was not returning to bring us back to Serrana as promised when we booked. We walked back and got pretty nasty sunburns. Recommendation- confirm exactly what you're paying for with Simon Says or go through Janus to use Mystic Man. This is our first time to St. Lucia and we couldnt love it more! We booked our trip after watching an episode of "Million Dollar Listing"
This is our first time to St. Lucia and we couldn't love it more! We booked our trip after watching an episode of "Million Dollar Listing" where Frederick is selling properties on Sugar Beach! I instantly knew I needed to go there and booked this AirBNB that night!! We planned our trip around the availability of this villa (these were the only two nights available for months!) We used this guide book to plan much of our trip so we hope this is helpful! Day 1: Landed at the airport and picked up our rental car. (Great decision-but not totally necessary!) We stopped for lunch at Mama Tilly's in Laborie. We had fried fish and bread and it was incredible! Before that we also stopped at Massy's Supermarket to grab some essentials (beer & water). Next, we continued to the villa where Janus met us at "Cool Breeze" to bring us the rest of the way. For the rest of the day we hung at the villa drinking beers and listening to music. 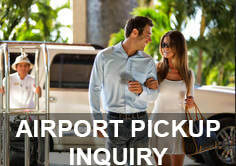 Janus arranged car service to dinner to & from Orlando's Restaurant. Food was a pre-fixed menu and was AMAZING! We even met Orlando himself! Oh- and we also met Mama Tilly! We were going to go to a bar called "Whispers" but we were exhausted so came back and passed out. Day 2: Woke up early and drove to Tet Paul Nature Trail. Good idea to go early because we beat the crowds! Our tour guide was funny and knowledgeable! He picked flower and herbs for us to try. Spectacular views!!! $10 each for the trail. Next we drove back to the villa and then got a car service to go to Anse Chastenet beach. The drive is gnarly and we wanted to relax & drink! We got lounge chairs for $12 each and super expensive drinks ($16 each!!). We rented snorkel gear for $11 each and it was great! We saw trumpet fish and sooo many others along with beautiful coral! Then we walked down to Anse Mamin for this Jungle burger we've been hearing about, sooo worth it!! The beach was super quiet. We hung out here for a couple of hours. Didn't even have to pay for chairs! We swam and drank Pitons and loved our time here. After that Janus' dad picked us up to go back to the villa! We found out HE is the Private Chef! There is a menu in the living room- if we had more time definitely would have done this!!! We had reservations at Dasheene @ Ladera! Best choice ever!!! Book a reservation for 6:00 so you can see the sunset! Five star views!!! They also had an amazing violinist so we hung out at the bar after dinner for more cocktails. Get the coquito! Then Janus and his son Marz picked us up!! Day 3: Woke up slow. Enjoyed breakfast and coffee at the villa. We ate fresh mangoes that Janus brought us! We plan to go to Sugar Beach today and then drive north to continue our vacation at another AirBNB on Rodney Bay. We cant say enough great things about Janus!! He truly is a super host!! He goes above and beyond to ensure you have the best stay! He treats you like family! We will definitely be back to stay at Janus' new property!! The only unfortunate thing about our stay at Serrana Villa was that we could only stay for one night. Tip - Skinny dip in the pool!! The only unfortunate thing about our stay at Serrana Villa was that we could only stay for one night. It was our first day we arrived in St Lucia & it was my beloved's 40th birthday. ​Janus coordinated a very nice car to pick us up from the airport & we got dropped off at the Viceroy Sugar Beach Hotel to enjoy the Jungle Spa while we waited for check-in. The spa was incredible. A must fro romantics seeking a bit of Rn'R. Our bags were brought to the house & Janus coordinated another pick up for us. We met him back at the house and he found us admiring all the beautiful fruit trees on the property. He invited us to come check out his other properties and new construction. It was very cool to see the bts' of his vacation villa concepts. 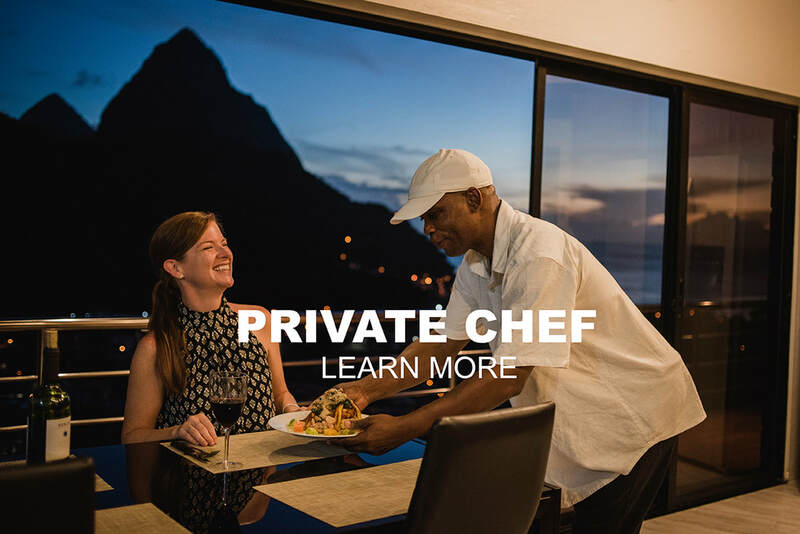 I surprised my love with the private chef that evening for dinner who was phenomenal! He even made a special cake which was the cherry on top of a magical first night in stunning St Lucia. We couldn't have asked for a better host or a better experience here. We will be back and hope to stay in one of Janus' new villas! I hope you enjoy your stay! We certainly did. We did hike Gros Piton which was HARD but so worth it! We love Janus and his team, shout out to Jermal for being the best! We have loved our time in St Lucia. We stayed north of the island for the first two days and PIgeon Island was definitely worth a visit. The south is where it's at though! We began our south stay in Sapphire 3 but I asked for our last night and my birthday be spent at Serrana which Janus made happen, no problem! Walk around town, it's beautiful. Snorkel Sugar Beach! Literally do everything others have suggested, it's all great! We didn't rent a car but Jermal picked us up and took us anywhere we needed to go! It was great! Sorry for sloppy writing but I want to drink more rum by the pool! Fedos & waterfront De Bellvue are great places to eat. We came to Seranna from the northern part of the island after staying in a resort and we have absolutely LOVED our time at Serrana as it has allowed us to truly experience St. Lucia. Serrana Villa- such a slice of heaven! .Coffee & breakfast at Serrana while taking in the magnificent view. .Sugar Beach-we parked at the top of the hill outside the gate and walked down to the public side of the beach. Gergeous beach!! We spent 4 hours there sunbathing, walking the beach, swimming & snorkeling (rent for US$10). We had a delicious lunch at the beachside restaurant. We saved our receipt from lunch to catch a free shuttle back up the hill to our car (paid the parking attendant $20ECD). .Anse Mamin- we arrived at Anse Chastenet at 8:45am to catch a 9:00am boat from the scuba center to Anse Mamin. It is so secluded, peaceful & beautiful. We paid $12USD each for a large chair & put towels on our chair to reserve while we went off & did our Jungle Biking excursion. We cannot recommend Jungle Biking enough!!! We had a blast! 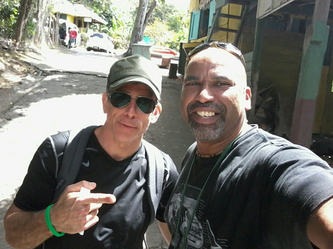 We paid $130USD total for the two of us but it includes the boat ride to Anse Mamin, cannondale bikes, helmaets and a guide to take you through the trails before letting you loose and riding as long as you like. After biking, we changed into our suits and enjoyed the beach! Beachside Grill at Anse Mamin- our favorite lunch yet! A must! .Tet Paul Nature Trail- stunning views & only took us about 30 minutes. We were there around 2:30pm & luckily there wereonly a few other people there at the time. I imagine it can get crowded. .Poolside at Serrana- we loved lounging by & in the pool in the afternoons. Very peaceful! .Dasheene Restaurant at Ladera Resort- What an experience this was! The views and food can't be beat! Get there at 5:00 for cocktails and appetizers (which they pass around) and enjoy the view. At 6:00 they begin seating people for dinner, so be sure to make a 6:00 reservation so you don't miss the sunset. Janus arranged for Fabian to drive us to and from dinner and Fabian was excellent. Very professional and courteous. Thank you Fabian! We are sad to leave Serrana today. Janus, thank you for a truly unforgettable stay! You have been extremely accomodating & helpful (we loved the Netflix:) ) and we hope to be back again one day. We would like to compliment you on your venture: Serrana Villa. Excellent! Thank you also for the tours of Sargas and Saba, both amazing properties. They carry your signature of excellence. ​After reading all the previous and informative entries, we didn't think we could add to the restaurant reviews or activity reviews. They are quite comprehensive. 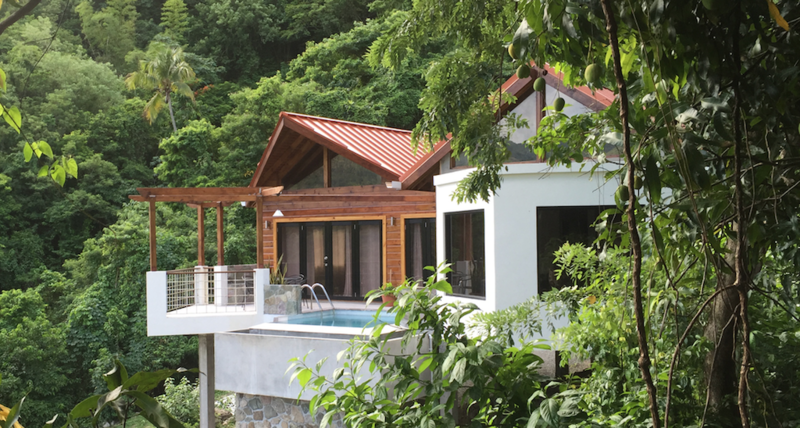 Sometimes while in the Caribbean there is a time constraint to get everything done (beaches, tours,culture etc) but at Serrana, the villa is so comfortable it is easy to just realx, jump in the pool and enjoy cocktails on the deck. We thoroughly enjoyed our stay and will recommend your properties to an aquaintance with virtuoso.